The school choice movement has gained political momentum in recent years, with programs having been established in Milwaukee, Florida, Texas, and elsewhere. But todays programs are nothing like the free market in education proposed four decades ago by the early proponents of school choice. Economist John Merrifield shows that the school choice movement has become mired in false alternatives, petty distinctions, and diminished vision. Yet, he argues that programs providing real educational choices must not be allowed to fail like so many government programsa freely competitive market for education must remain the ultimate goal. 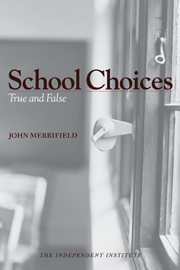 School Choices: True and False charts a course for the achievement of this goal. Chapter 5: What Side-Tracked The School Choice Movement?